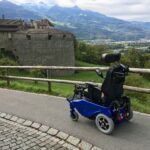 Caterwil GTS3 is a unique product that allows the user to feel free using a wheelchair in a city environment. 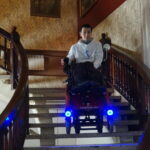 When driving on wheels the wheelchair can safely go up and down the surfaces with an angle of inclination of up to 15°. This is enough to overcome most of the city ramps. 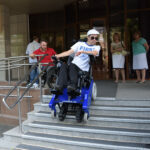 On a track mode the wheelchair can climb stairs up to 40 degrees. 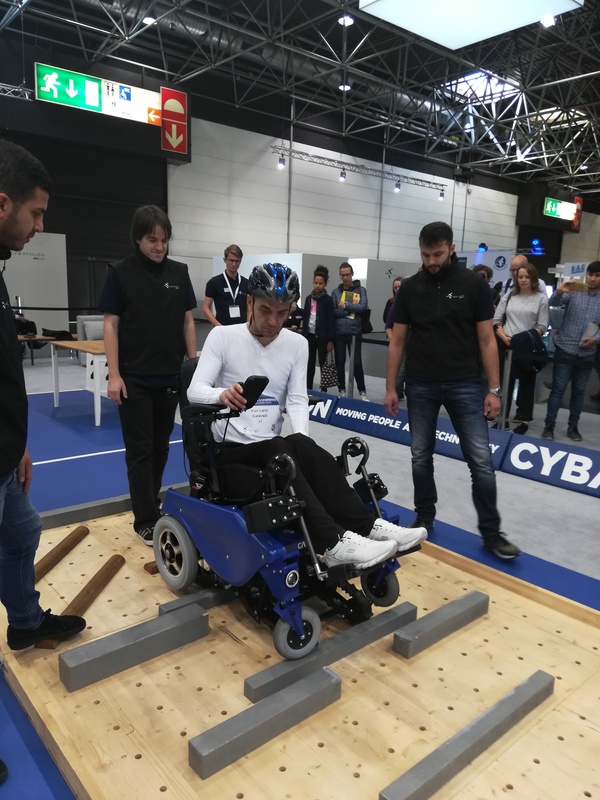 While designing the wheelchair, all particular characteristics of different building construction were taken into account. The rounded steps with rounding up to 50mm in old buildings are also not a problem for Caterwil. Modes are switched by pressing a button on a controller. 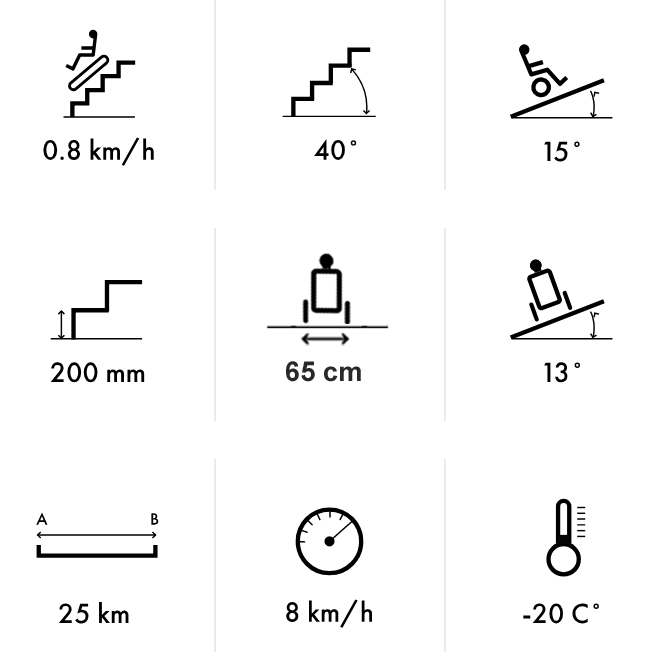 The left and right tracks are moving independently that makes possible to climb curved stairs and turn on a point in a tank style. 1×1 meter space is enough for 90 deg turning. 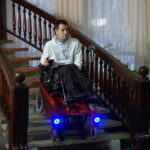 This makes possible the utilization of the wheelchair in narrow porches. 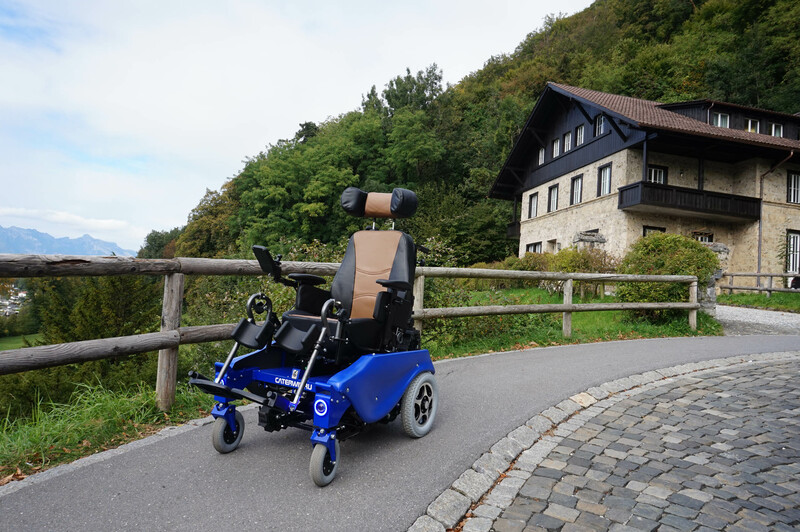 The width of the Caterwil GTS3 is 65 cm only that’s why it fits in usual elevators, doorways and turnstiles and feels free in houses. 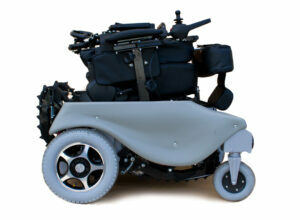 On a wheel mode the angle of the whole seat can be adjusted from controller for the optimum comfortable seating. User can adjust the angle of the backrest, angle of each footrest, length of each footrest, height of the armrests, length of the headrest for maximum convenience. 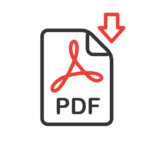 These adjustments are manual in a Basic configuration but electric options can be installed. The pneumatic wheels absorb the vibrations and provide a soft and pleasant move. 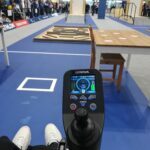 The sensitivity of the joystick and the maximum speed can be adjusted on the controller to user needs and environmental features, which allows the user to choose the optimal mode. 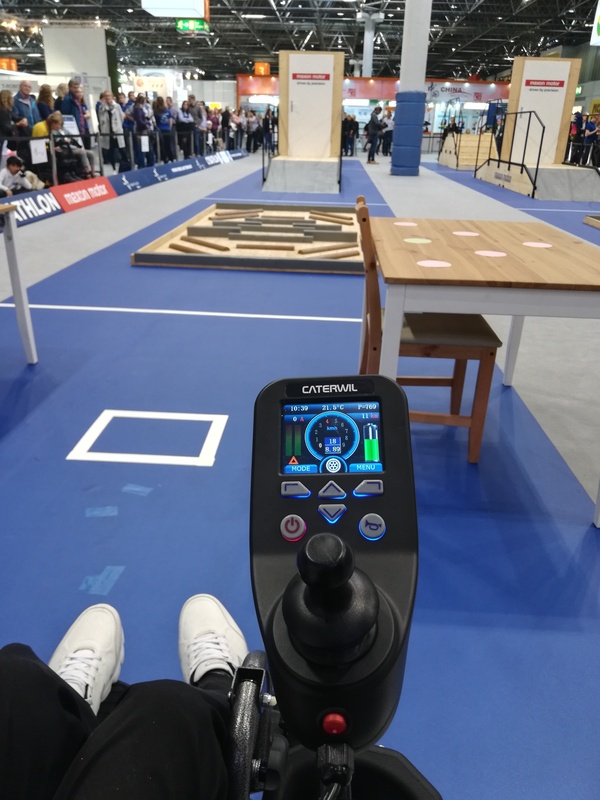 Gyroscope seat controller totally managed by electronics and keeps the chair in horizontal position even when climbing 40 degrees stairs. The unique 4-tracked Caterwil scheme guarantees the maximum contact and the best grip when moving upstairs. 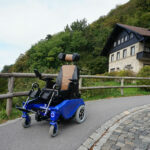 Wheelchair is equipped with automatic electromagnetic brakes that fix the wheelchair when stopped or in case of emergency. 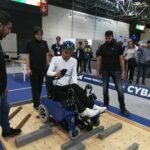 There are two red levers on the back side that allows switching the wheelchair in a freewheeling mode for pushing the wheelchair. Front and rear LED optics allow users to drive the roads at night or any reduced visibility conditions and be fully visible for other drivers. There are two types of safety belts are available as options for ordering: 2-points and 4-points belts. 4-points safety belt is required for users who have problems with holding the body. 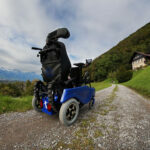 The electronics has a wheelchair health system that scans every second the condition of wheelchair parts. In case of any malfunctions it tries to fix it or send the user warning on a controller. The Basic configuration GTS3 has a folding seat. 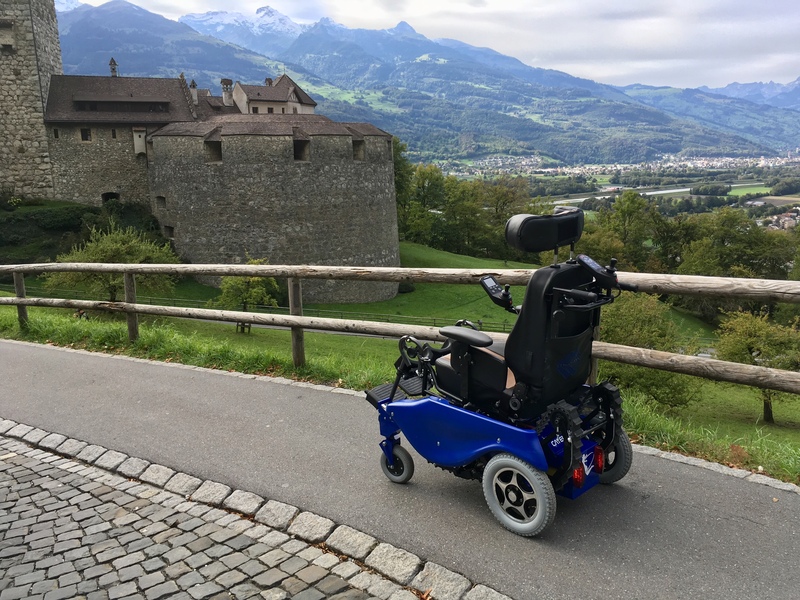 The height of the folded GTS3 is 78 cm – this allows the wheelchair to be driven into minivans, most cars of SUV type and many crossovers. 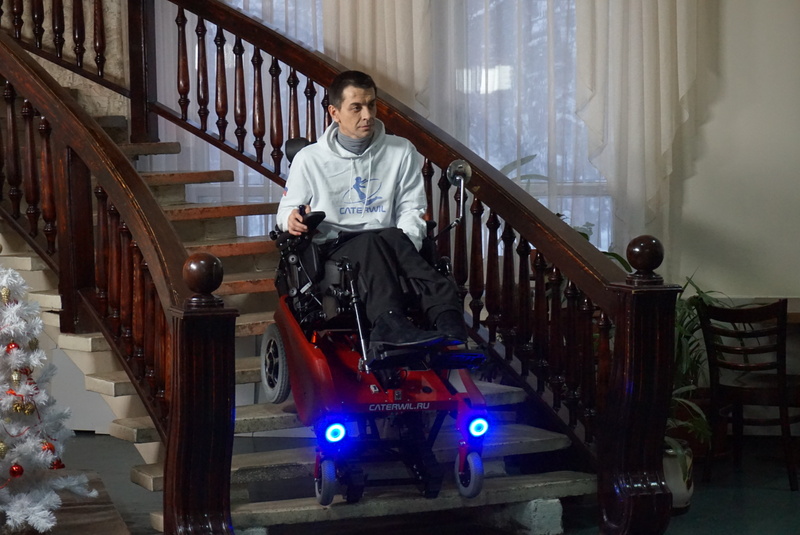 With the folding ramp the GTS3 can be driven into the trunk by one person. 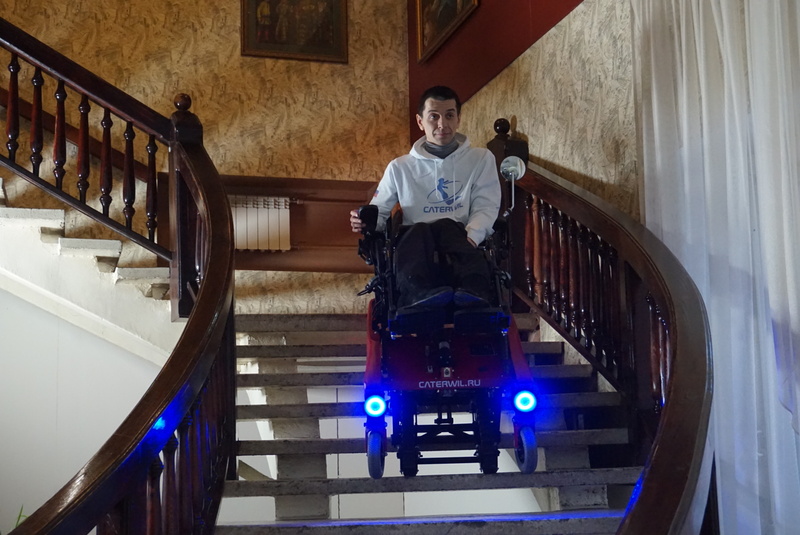 The wheelchair is accepted for transportation in airplanes. 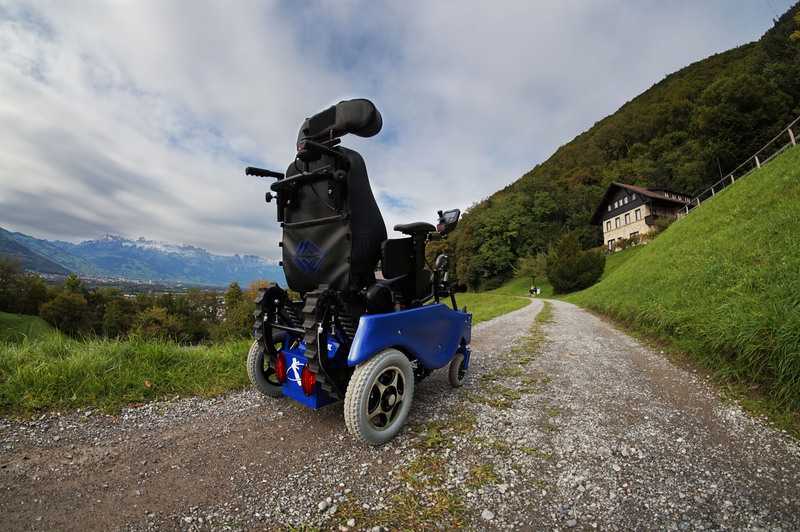 It is possible to travel on Caterwil in wheelchair accessible trains, ferries and coaches.